A recently published Forbes article has highlighted that nearly every research firm in the field is now predicting the lucrative potential for the 3D printing market. 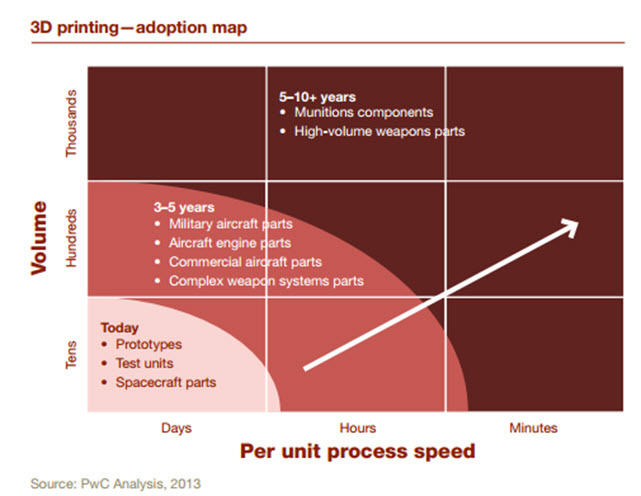 Ranging from simple, open=source printers to complex, engineer-to-order production, 3D printing has already begun to redefine the manufacturing value chain across a number of industries, including aerospace, defense and healthcare. As previously reported on Bits & Pieces, the next-gen technology is expected to continue its acceleration towards mainstream with forecasts calling for it to become a $16 billion global industry within the next five years. In support of these projections, Tech Pro Research recently highlighted that 60% of businesses have either already used or are in the process of evaluating 3D printing within the enterprise. 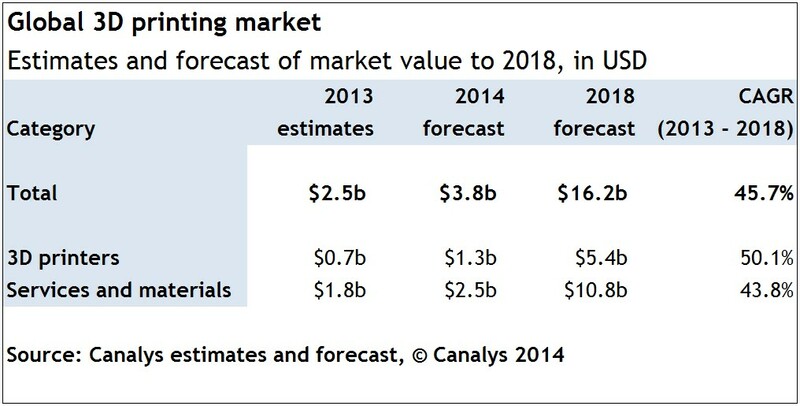 Major analysts Canalys foresee the global 3D printing market to grow from $2.5 billion in 2013 to $16.2 billion by 2018, reaching a CAGR of 45.7% in the forecast period, while IDC believes that worldwide 3D printer sales and installation base will grow at an annual growth rate of 59% through 2017. With these each of these research firms holding such lofty expectations of 3D printing, the customizable future surely looks bright. 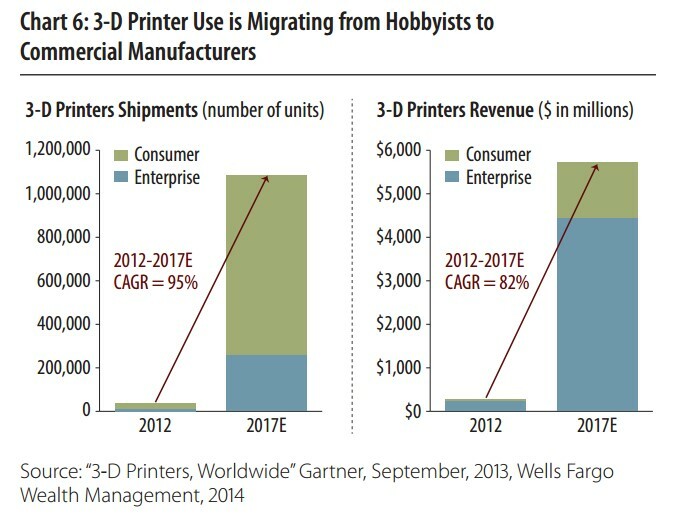 Similarly, Forbes also reports that Wells Fargo projects shipments of 3D printers are expected to grow at a CAGR of 95% per year from 2012 to 2017 with revenue expected to grow at 82% in the same forecast period. 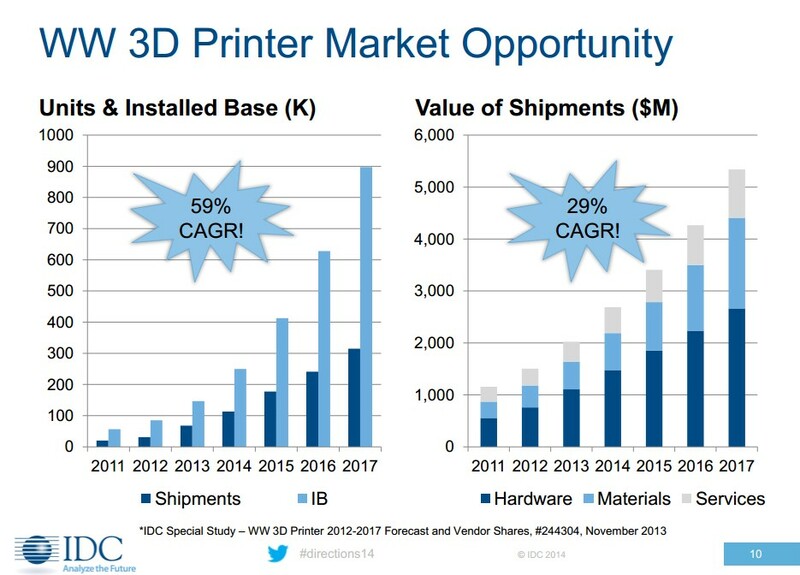 Furthermore, Gartner predicts that 3D printer shipments will surpass 1.1 million units by 2017 and end user spending will rise to $5.7 billion, reaching a CAGR of 82% within that time frame. Morgan Stanley analysts have called for the additive manufacturing or 3D printing range from $7 billion by 2020 on an 18% CAGR to aggressive market scenarios reaching $21.3 billion by 2020. With 3D printers being shipped at higher rates, manufacturers must begin to build their practices around the new wave of technology. 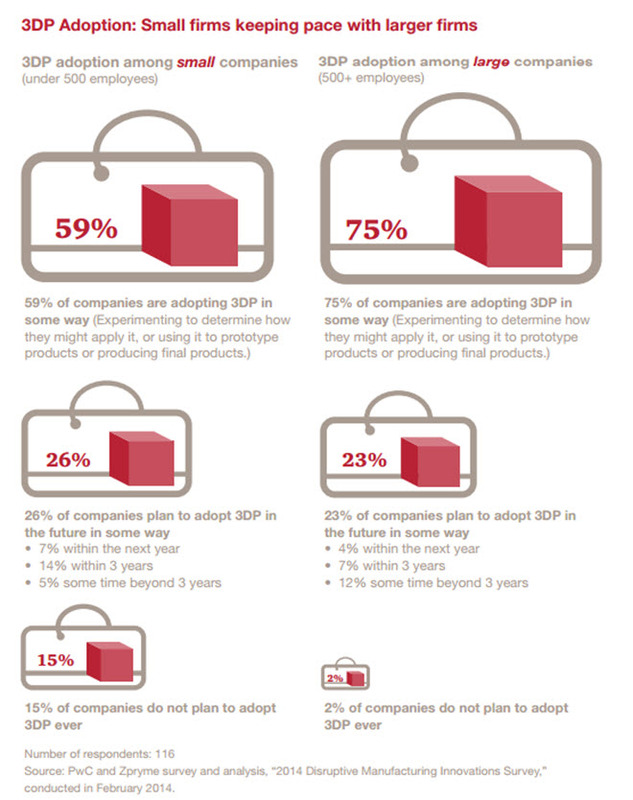 According to a recent PwC report, 67% of surveyed manufacturers currently use 3D printing tools and another 25% plan to take on the technology in the near future. PwC goes on to demonstrate that as process quality increases and process speed quickens and feedstock costs drop, the market will grow exponentially. As you can see, it is quite obvious that many of the market power brokers believe 3D printing is here to stay, and will take up a large portion of the tech market in the future. With more resources in the marketplace, this can only bring positive things for the Maker community! This entry was posted in 3D Printing and tagged 3D printers, 3D Printing, 3D Printing Forecast, Forbes, Maker Movement, Makers on August 14, 2014 by The Atmel Team.